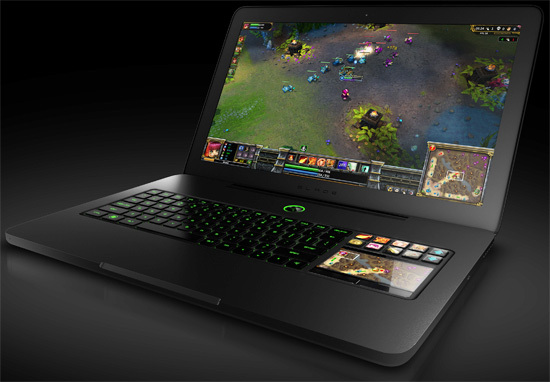 Despite costing a hefty $2,799, the Razer Blade gaming laptop is immensely popular. The laptop, which has all the power of a high-class gaming desktop, was initially announced back in August 2011. Since it was made available, the device has completely sold out with every single unit in the first wave gone within 30 minutes, according to Razer’s Facebook page. Razer has yet to release a specific sales figure or just exactly how many units were sold. Just in case you have no idea what I’m talking about or what the Razer Blade is, let me refresh your memory. The Blade is a 17″ gaming notebook weighing a little under 7lbs and measuring only .86 inches thick. The device comes equipped with a small LCD screen located near the keyboard that is capable of displaying in-game information or being used as a second screen to watch videos or surf the web while playing. In addition to that, the Blade comes with 10 special keys located above the LCD screen that allow you to program them specifically for whatever game you are playing at the moment. On the inside, the Blade houses a 2.8GHz Intel Core i7 2640M processor, 8GB of RAM, an Nvidia GeForce GT 555M graphics card with 2GB of video memory, a built-in HD webcam, a 256 GB SSD, two USB 2.0 ports, a USB 3.0 port and HDMI port. This is definitely the top gaming laptop on the market and obviously one of the most desired so, if you really really want one, you are going to have to buy it as soon as a new shipment hits the market, otherwise you will just be stuck waiting even longer. Better start saving!